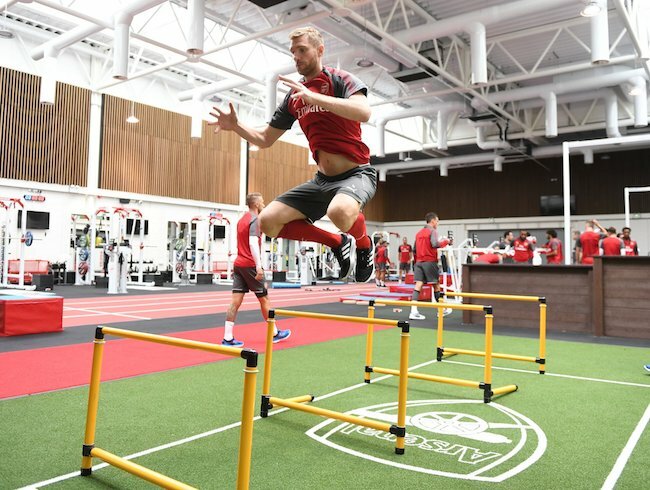 Premiership footballers won’t ever be the people at the gym with the biggest muscles or the strongest punch, but you can guarantee they’ll have agility, flexibility and some of highest fitness levels. Their workouts aim to improve their performance on the pitch, but whether you’re in a local five-a-side league or don’t play the game at all you can still give their exercise routines a try and hope to see great results. Being fast paced is key for footballers, so building up speed and strength with jumping exercises (also known as plyometrics) is essential. You’ll often see footballers warming up on the pitch by jumping over hurdles and cones as these type of workouts work muscles hard in a short space of time. Try jumping hurdles one at a time with both legs bent to lessen the impact, or if your local gym or training space doesn’t have hurdles use cones instead. Try jumping over them keeping your knees high and your arms at a 90-degree angle. Set the last cone further away than the others so you’re really working yourself to the very end. Basic hopping exercises in a T-shape or simple step ups on a box are also very effective. Footballers tend to focus on building core and trunk strength as it helps with overall fitness as well as making fighting off other opponents easier. Most of these exercises don’t require much more than your body weight so they should be easy to replicate at home. Try doing sets of planks, mountain climbers, crunches and push ups; which will work your arms too. If you want to a more intense workout, include equipment. Get someone to place a 5-20kg weight between your shoulder blades and try a weighted press up. Pay attention to keeping your back and hips straight as you lower your chest to the floor and be slow pushing back up to really work your body. 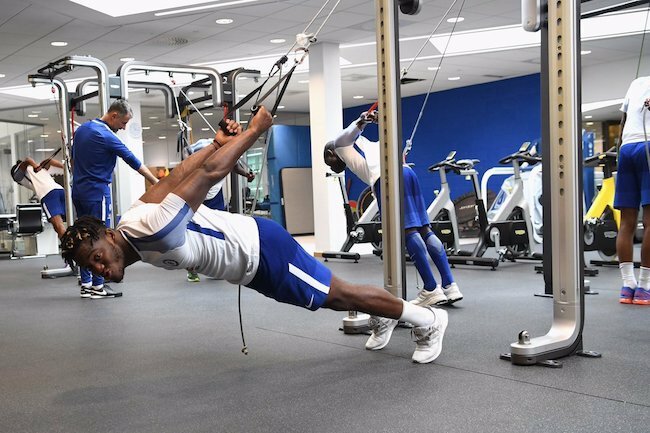 Suspension training with ropes or straps are popular among the fitness community but it might not seem like the first choice of workout for a footballer. TRX is actually a great way to strength and condition the body and offers many options for athletes. Hamstring curls, Y-flys and jumps with the ropes are all great workouts, but if you’re specifically interested in training to be match ready you should be squatting. Hold the ropes and do single leg squats to build up your strength in each limb. Almost every move in football is done with one leg so this exercise will help you to avoid injury while also strengthening your knees, quads and hamstrings.